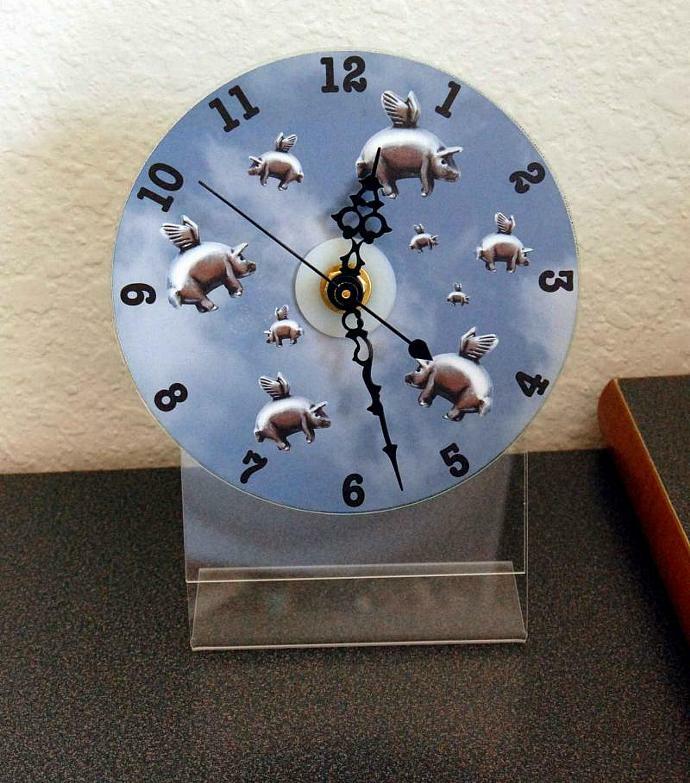 A herd of flying pigs takes to the sky on the face of this CD desk clock. This mini quartz movement clock will quietly keep time for you. I combined my original blue sky and pigasus pin images into this whimsical scene of pigs flying across the sky. I superimposed a clock face on this scene for easy time telling. The image is printed on a CD using an Epson inkjet printer. The clock is mounted on a sturdy clear plastic stand. The clock movement that I chose for these clocks is one that I have used in the past to replace the noisy ones that drive me crazy and often come in battery operated clocks. It is very quiet and I have found them to be extremely accurate as well. The quartz clock movement is made in the USA and runs off one "AA" battery (not included). It also has an on/off switch. The clock measures about 4 3/4 inches across and is about 1 inch deep, measured from the second hand to the back of the clock movement. Attached to the stand, this desk clock measures almost 6 inches tall. The foot of the stand is about 1 1/2 inches deep. A wall mounted version is also available in my shop along with a variety of other flying pig goodies, http://www.zibbet.com/EclecticSkeptic . © Eclectic Design Choices - All photos/altered photos are protected by Federal Copyright Law. 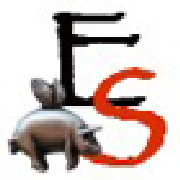 Pigasus permissions courtesy of JREF.